Was anyone else glued to their televisions today?? I got up at 7.15am, so I could watch the BBC's coverage of this spectacular wedding from 8 o'clock onwards this morning. 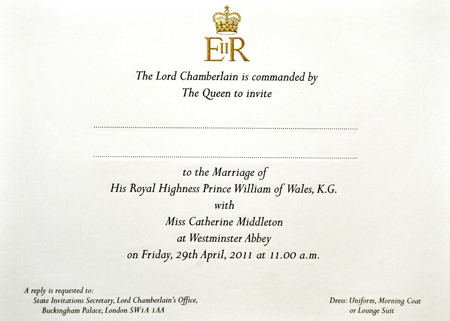 If you have no idea what wedding I'm talking about, it's the wedding of Prince William and Catherine 'Kate' Middleton. This much anticipated wedding day has finally come to a close (well, unless you are at the wedding reception!! ), so I thought I would refresh your memory on what some very important people wore. Kate Middleton's dress a.k.a THE dress was designed by Sarah Burton, the creative director of British fashion house, Alexander McQueen. Kate is clearly very fashion forward and it's so nice to see her supporting British designers. It is made of French Chantilly and English Cluny lace and it's hand sewn, with patterns of daffodils, rose thistles and shamrocks. Underneath that, there is ivory and white silk. The train is quite short for a royal wedding dress as it is just 2.7 meters, but it was definitely worth it because she looked stunning!!! She wore a Cartier tiara that was given to the Queen for her 18th birthday which the Queen loaned to her and her earrings by Robinson Pelham, were a gift from her parents for this momentous occasion. The inspiration for the earrings comes from the Middleton family's new coat of arms which includes oak leaves and acorns. The padded hips and narrow waisted features on this dress are a hallmark of the late, Alexander McQueen. 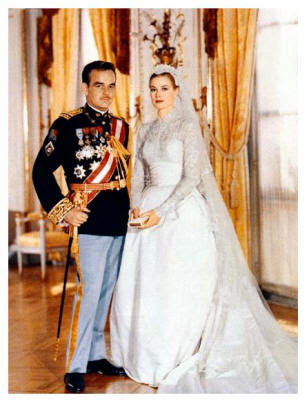 The dress is also very similar to the dress Grace Kelly wore for her wedding both featuring long lace sleeves. 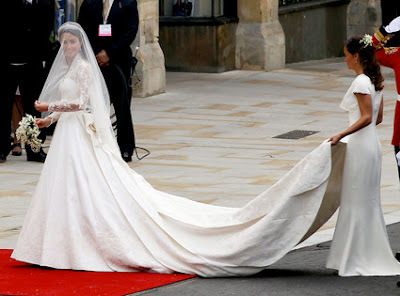 Kate looked breathtakingly beautiful in this both traditional and modern wedding gown and I definitely think this dress will stand the test of time. The Queen wore a crepe wool primrose yellow dress and a matching tailored coat designed by Angela Kelly, which had hand sewn beading at the neck in the shape of sun rays. Angela also designed a matching crepe hat with hand made silk roses and matching apricot leaves. A piece of jewelry she wore was Queen Mary's True Lovers Knot Brooch. 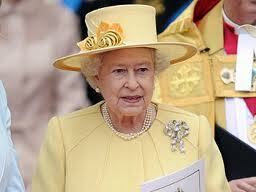 Very spring appropriate your Majesty! David and Victoria Beckham were a couple of the lucky celebrities invited to the ceremony. David wore a Ralph Lauren suit whilst Victoria sported one of her own designs, a midnight blue tunic dress, which i thought was very simple and classy. She also wore a Philip Treacy hat. Other guests who are worthy of full points for their outfit choices are Kate's mother, Carole Middleton, who donned a Catherine Walker sky blue wool coat dress with matching satin piping and trim over a sky blue silk day dress. Pippa Middleton, who is Kate's sister and maid of honour, looked lovely and elegant in an ivory satin based crepe dress designed by Sarah Burton for Alexander McQueen, who also designed Kate's dress. And ofcourse I'm not going to forget about the groom, Prince William, who looked absolutely dashing. I really hope you like my Royal Wedding post!